I did a bad, bad thing last week. I browsed the knitting books on Amazon.com, something that seriously endangers the balance on my credit card. But don’t worry, I was able to restrain myself. 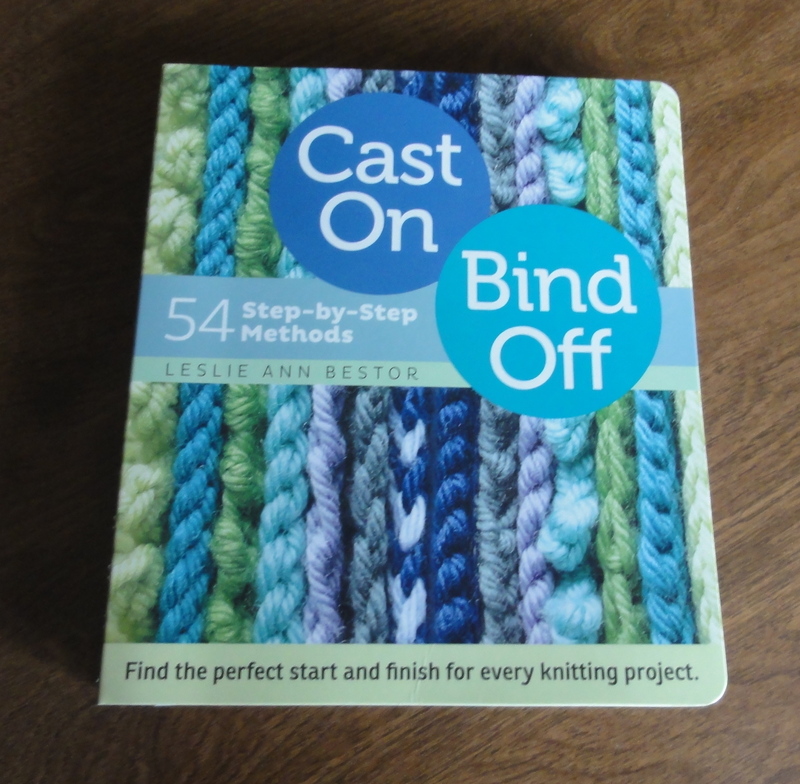 I purchased only one knitting book, Cast On, Bind Off: 54 Step-by-Step Methods by Leslie Ann Bestor. I have another knitting book pre-ordered called Cast On, Bind Off: 211 Ways to Begin and End Your Knitting by Cap Sease that is supposed to be published August 20th. 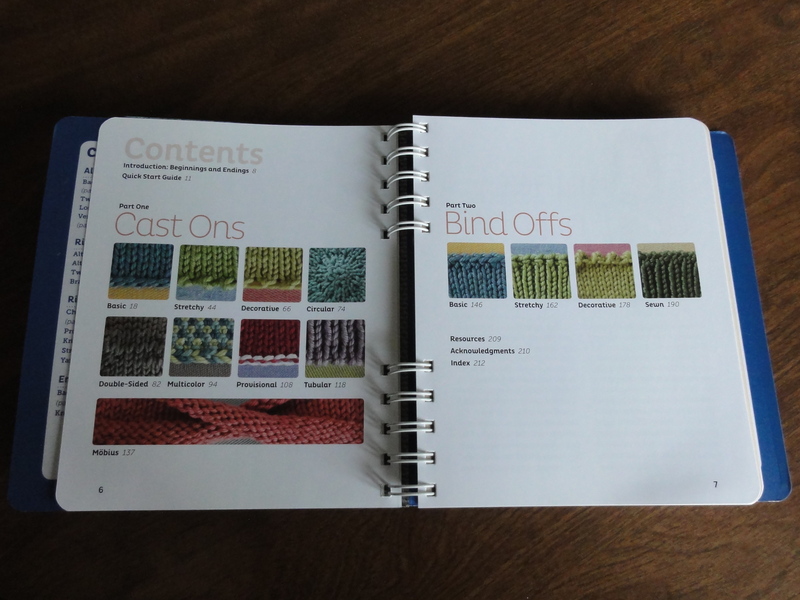 If you are a knitter, you need no explanation for why I am buying two books on casting on and binding off. If you aren’t a knitter, poor baby, you probably think I’m nuts. But I can explain. We knitters, or at least the ones I speak for, are always on the look-out for the perfect way to begin and end our knitted items. Therefore, we feel compelled–Compelled! I tell you!–to explore any and all resources that might open the door to a technique that perfectly begins or ends the scarf, socks, sweater, shawl, mitten, or hat that is about to go OTN. There will surely be some overlap between these two books, but each one will probably contain something that isn’t in the other, and that something might be just the thing. Capisce? I cannot speak for all knitters. I know that there are some knitters who always use their one-and-only method for casting on and binding off, no matter the project, and are perfectly happy with the results. But most of us like to match the method to the project. Sometimes the edge needs to be very stretchy; other times it needs to be firm. Some projects scream for a decorative edge while others need an edge that just blends in. And knitters are always in search of cast-ons and bind-offs that look identical. As you can tell from the titles of the two books I have purchased, there are dozens, even hundreds of ways to begin and end one’s knitting (and I’m determined to try them all). So books of this kind, ones that are devoted to just the beginnings and endings and bring them together in one sweet volume, are needed in the knitting world. so, if you are about to cast on a sock knitted from the cuff down, and you want a really stretchy cast-on, turn to the “Stretchy” section and choose from the six techniques offered. It’s easy to choose because for each technique there is a list of characteristics–looks good on both sides, strong and long-wearing edge, for example–and a list of what the cast-on or bind-off is good for, such as tops of socks or adding stitches at the end of the row. One of the neatest features is that when a particular bind-off matches the appearance of a particular cast-on, Bestor includes that information in the “Good For” list. 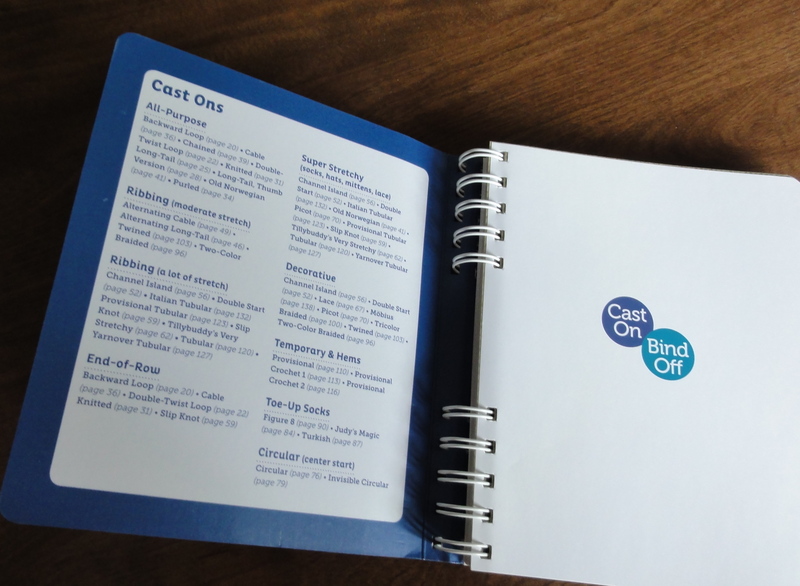 The inside front cover lists cast-ons by categories so that the knitter can tell at a glance where in the book she can find an appropriate cast-on. The inside back cover does the same with the bind-offs. There is also a table of contents and an index, so finding what you are looking for is pretty simple. The step-by-step instructions are well written and clearly illustrated with photographs, but I wish the illustrations were drawings instead. Drawings are better than photographs because drawings show more detail than photographs. On the other hand, photographs are better for showing what the actual edges look like in real life, and the photographs in this book are just fabulous. Also, I was disappointed to see that all versions of the long-tail cast-on in the book begin with a slip-knot. I prefer to start long-tail cast-on without a slip-knot. The beginning of the cast-on just looks neater without the knot. 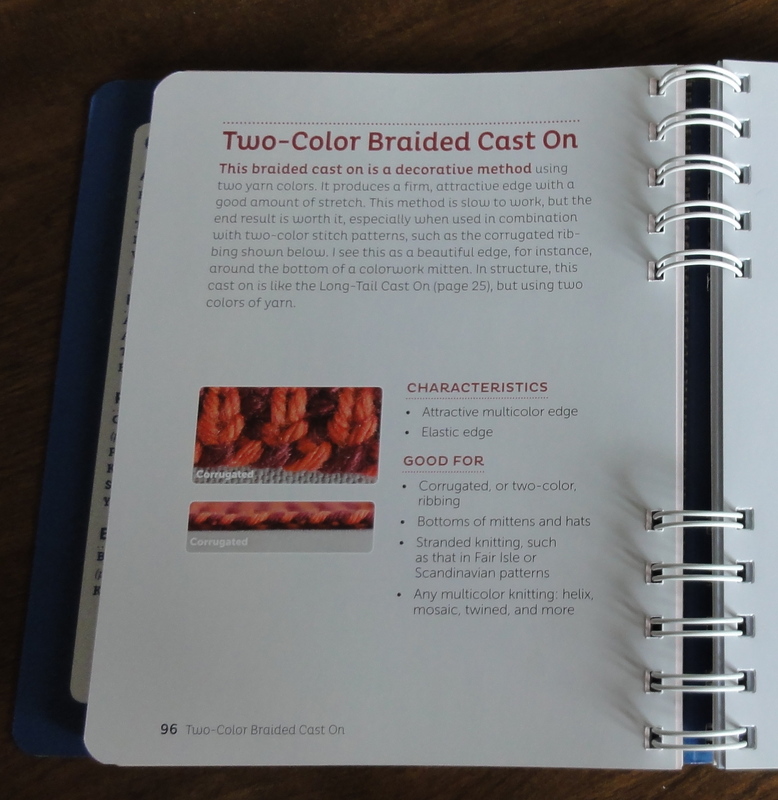 I know I’m quibbling, but I think that using drawings to illustrate the steps for each cast-on and bind-off and showing knitters how to cast on without a slip-knot would have made this book perfect. Yes, I think this book is that good. I love, love, love this book. This entry was posted in Knitting and tagged Bind Off, Cast On, knitting techniques, Leslie Ann Bestor. Bookmark the permalink. Did you review the 212 book? Would you get both? Q – Just great! 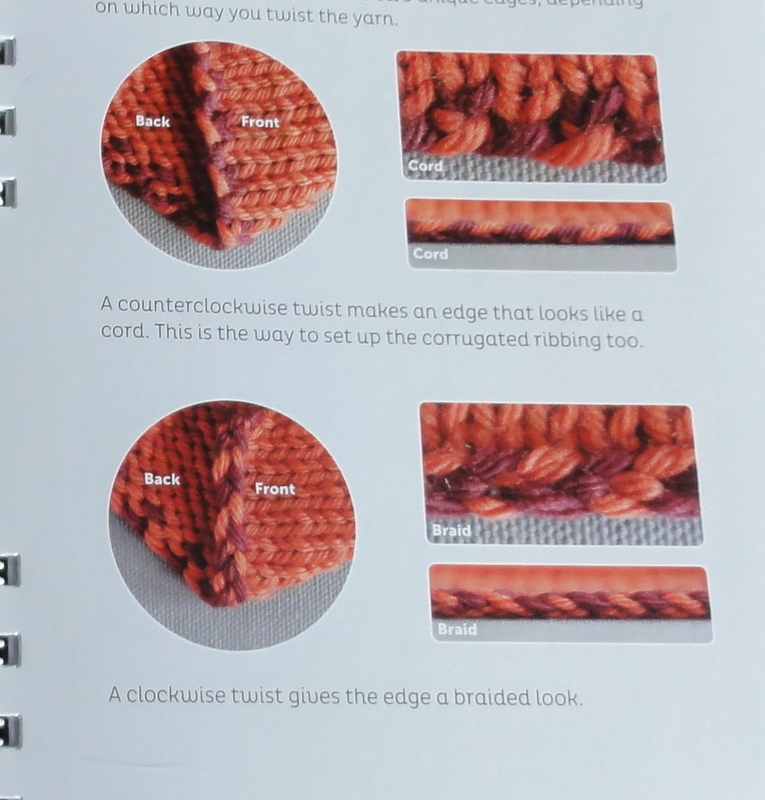 I really need another knitting book. 😎 Will check this out. Looks good. I too prefer to do my long tail without a slip knot, the way I was taught back in the dark ages by my mom. My mother taught me to do the long-tail cast on starting with a slip knot, and then making backward loops onto the needle with the tail yarn, throwing the working yarn, and making a stitch just as if one were knitting. It’s kind of difficult to describe, but it is just like the other way of doing the LTCO except instead of holding the yarn in one hand, you hold it in two. The results are exactly the same. I’m one of those knitters who thinks that the “right” way is the way that gives you the results you want.